All hail the gods of data recovery! I was able to salvage my recording of the International Space Station flying over San Francisco on May 3rd at 2:45 PM. While animated GIFs are fun, giving you that vintage 1960s Mercury feel, smooth video from a fully operational space station 190 miles up is even better. 5 miles per second never felt so smooth. 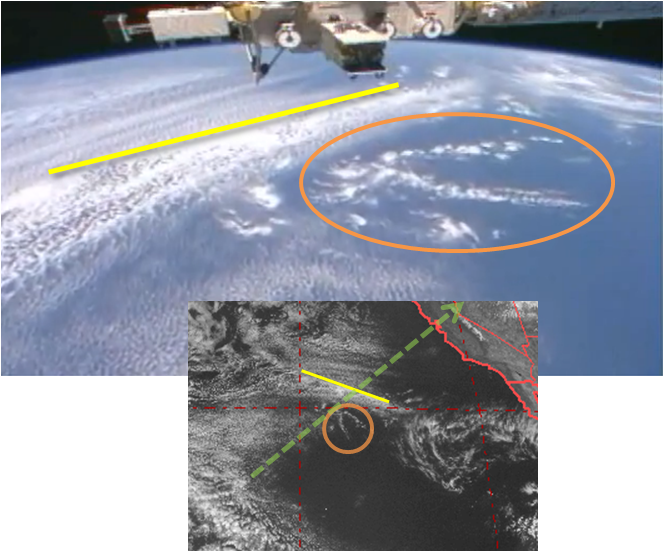 If you look closely, you can see the same cloud patterns from the video — the wishbone-shaped one (orange circle in the crop below) and the line of clouds (marked in yellow) are easiest to match up. The green dotted line is the path of the ISS. All we need now is to petition @NASA to install permanently mounted HD cameras on the ISS — one forward, one straight down, and one aft. A downward cam with zoom would be nice too. And a schedule of when the video is expected to go out would be rather lovely, along with an archive — maybe the past day or so? I do believe these would be justified usage of valuable tax payer dollars. ← Dude, Where’s My Car?